"Inventing the DVR was just a warmup"
This thing is just a polished Series 3. Yeah there's a new UI, which is nice, but from what I've read it isn't anything fancy, just a little re-worked, and widescreen. No fancy animations or anything. It is cool your show is always displayed now when you're in the menu, and I definitely would prefer it over what we have now, but come on, that's it? It can still only record 2 shows at once. Plus they are now bragging it can play netflix/blockbuster/amazon/youtube, but so can the Series 3. I just slingbox'd home and checked, since I don't subscribe to any of those services and it doesn't really apply to me anyways. Can it even stream video from your PC now without 3rd party trickery? This thing is a modest update to the Series 3 at best, certainly not a revolutionary upgrade from the Series 3. I'm hoping I'm missing something here, because this looks like a big disappointment, especially since TiVo users have been waiting years for a new TiVo. Remember it took them what, 2 or 3 years to get the HD unit out after demoing it at CES. My guess is that it'll be another 2 years until Truway or whatever will be rolled out, but we'll still be stuck with TW and CCI Byte resctrictions here. It's more than an S3/HD, it does have a much faster CPU. if you have an S3/HD, it's questionable on whether or not it's worth the upgrade. If you still have a S2 box, then it's worth the jump. I kept my two S2 boxes active after getting the HD, I'm trying to decide if it's worth upgrading one of the S2 for the Premiere with the 20% upgrade discount. If it had supported DLNA, that would have been a cool feature to have. It feels like they missed something here. If you still have a S2 box, then it's worth the jump. I kept my two S2 boxes active after getting the HD, I'm trying to decide if it's worth upgrading one of the S2 for the Premiere with the 20% upgrade discount. I'm keeping my S2 box. That's the only one I can use to get programs off the box to my ipod touch. Since it is an analog box, there are no cci restrictions. Same here. Keeping my S2 units. I'll never get another S3 or higher as long as my only "choice" is TW with CCI restrictions. 2. The lifetime plan would be $200 cheaper for existing customers. Overall, a pretty good deal for existing TiVo owners. A new TiVo with lifetime service for $498 + tax & shipping. When we first heard rumors of new TiVo hardware back in April of 2009, our imaginations started racing. The current TiVo HD and HD XL have been the best DVRs on the market for their entire three-year run, and while they've received significant feature updates in that time, the overall experience of using a TiVo simply hasn't kept up with the explosion of online content and the revised viewing habits of consumers -- in fact, the interface has remained largely unchanged for nearly a decade. So while the actual TiVo hardware has actually gotten smaller and simpler, it's the software that's received a substantial makeover this time around -- it's migrated to Flash, and the main elements have been totally redesigned for HD displays and the invisible integration of online video services. 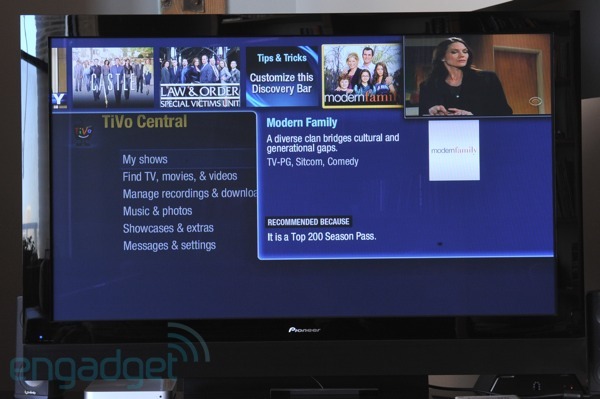 Is it enough to keep TiVo afloat in a sea of cheap cableco DVRS? 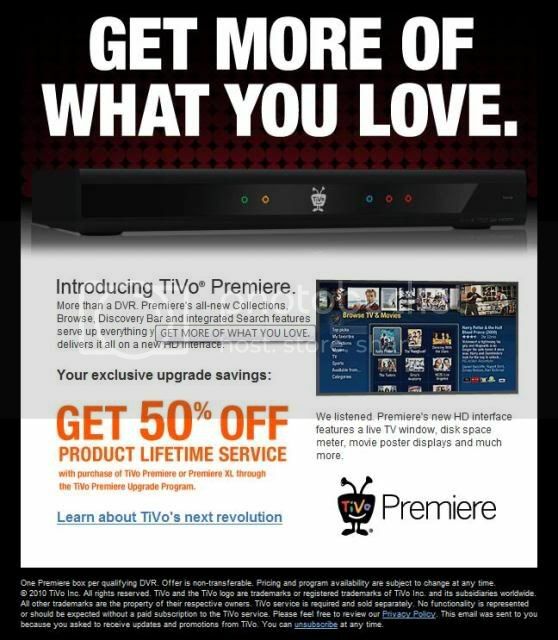 It is worth upgrading from an existing TiVo HD? There's only one way to find out -- read on for our full review. 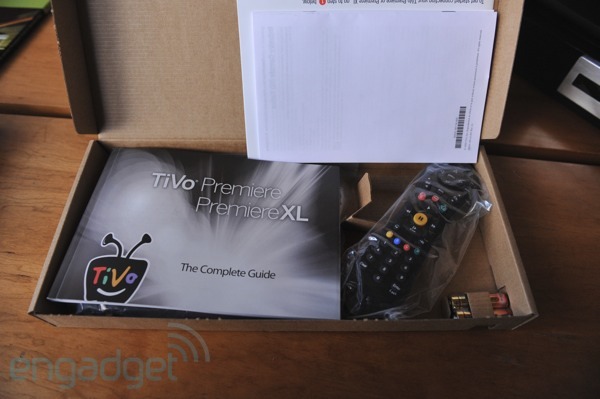 Externally, the $299 TiVo Premiere we were sent for review isn't much to write home about. 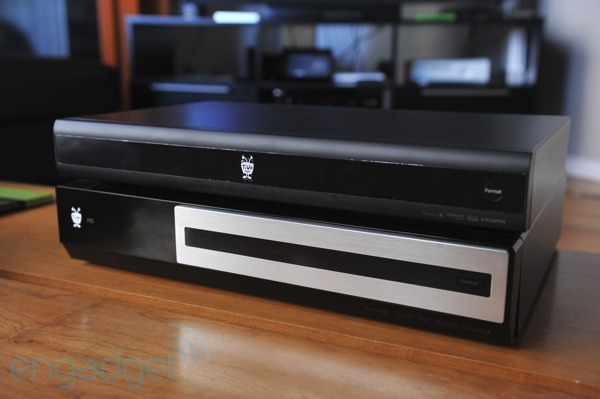 It's thinner and shorter than the HD, and the front face is almost completely black apart from the TiVo logo, power and record lights, and an output-format button. Around back there's a single CableCARD slot, cable and antenna RF inputs, two USB ports, an Ethernet jack, and an eSATA jack for external storage, as well as HDMI, component, and composite video outs. You still have to shell out for the USB WiFi adapter, which is unfortunate considering the Premiere's $299 price tag. After TiVo's Jim Denney made an video appearance at the Intel Developer Forum last year, we were sort of hoping to see this new generation of TiVo hardware move to the hot new Atom CE4100, but no such luck -- the Premiere stays true to TiVo's roots with an embedded Broadcom SoC running Linux, although the main parts of the TiVo interface runs on Flash now. The updated interface comes with some increased system requirements -- which is why it won't run on Series3 boxes -- and the new hardware is much more powerful than before. It's actually a dual-core system, although TiVo's only using a single core at the moment due to stability issues. A update rolling out sometime in the very near future will enable the other core and hopefully speed up the interface, according to TiVo -- but more on that later. The system is Energy Star-certified and whisper-quiet; we never heard it make a sound. 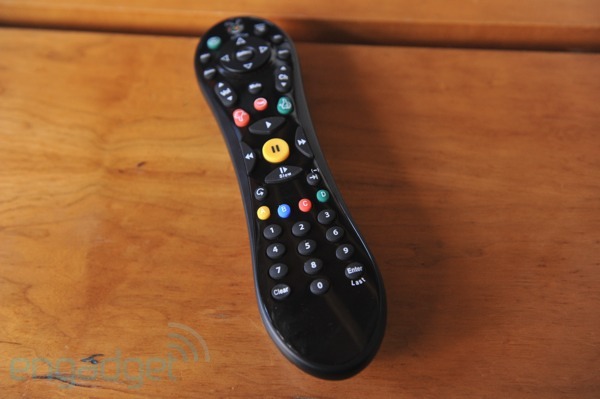 We'll be blunt and say the revised remote is a bit of a disappointment. It's made out of a glossier plastic, and it feels extremely insubstantial in the hand. TiVo remotes have long set the standard for design and quality, but this one almost seems like TiVo KIRFed themselves -- although we're told the only real change is the plastic used. The $499 Premiere XL comes with an updated version of the Glo remote from the Series3, but what we really want is for the hot QWERTY slider remote to be packed in the box -- the interface is based on search now, and it needs a serious text input solution. Too bad: it'll run between $50 and $100 when it comes out later this year -- we're told the fall, but it could be sooner. 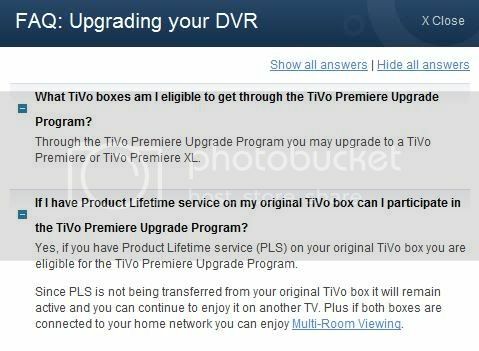 While TiVo's certainly made strides in the interface department, the out-of-the-box experience with the Premiere is still the same halting process as ever -- if you're a new owner, chances are you'll need a visit from the cable company to get all set up with a CableCARD and have it activated, and that's always fraught with peril. We can't blame TiVo for that, since so much depends on your cable company, but a little more hand-holding for new customers might have been nice -- setting up a new TiVo for the first time isn't exactly plug and play. What's baffling to us is that there's no benefit to being an existing TiVo owner, at any level. You can't just swap boxes in place, for example -- the tip of the power connector has changed. More importantly, you'd also better be prepared to lose all your shows and recording preferences, since there's no backup or restore options here, and be ready to spend some time on the phone getting the cable company to re-pair your existing card to the new hardware, since it's not automatic -- most of our channels worked after we just stuck the card in and booted up, but premium channels were broken until Comcast activated our unit. TiVo tells us they'll put up some better information for existing TiVo owners online shortly, and there might eventually be some provisions for backing up Season Pass and WishList settings online in the future, but for now there's nothing. Once you do get everything plugged in and set up, you still have to drill through something like 35 settings screens, and wait for channel data and software updates to load. (We still don't know why TiVo doesn't include programming the remote's power and volume buttons in the initial setup.) All in all, you're looking at an easy hour or more -- make sure you bring a book or something. TiVo's really hyping up the new Flash-based main interface of the Premiere, and for good reason: it's much sleeker than the decade-old TiVo UI we've come to know and love / hate, and offers far more search, discovery, and content integration options than ever before. The most prominent feature of the new UI is the "discovery bar," which intelligently populates based on what you're looking at -- it'll show you related new shows while you're looking at your recordings list, and featured content based on user trends and highlighted promotions on the main screen. You can also customize the discovery bar and pin shows to it, and you can tweak it so you get better recommendations. TiVo says that the Premiere's interface "blurs the line between broadcast and broadband" by showing content from online service providers like Netflix, Amazon and Blockbuster right next to traditional broadcast content, and that's certainly reflected in the interface -- at least at the top level. The idea is that every content source is treated equally, so if you're searching for a show or movie you're presented with several ways to get it -- for some content that means you'll have your choice of recording it, streaming it from Netflix, renting it from Blockbuster, or buying it from Amazon. You can also switch services off selectively, so if you only want to see movies that stream from Netflix you can set that. It's a great idea, and when it works it's extremely convenient, but we saw things glitch out a few times -- searching for Californication showed icons for Netflix and Amazon on the results page, but no streaming options were displayed when we opened the listing, even though the show was in our Netflix queue. How content is listed also affects the results -- Netflix lists Food, Inc. as "Food, Inc. (2008)," so it wasn't combined with the main result for the movie. Getting all these little details right will be critical to making this system useful -- otherwise you might as well figure these things out manually. There are also lots of pre-sorted and curated categories in the Browse TV & Movies section, so it's easy to find romantic comedies, or only look at specific sports, or easily record all of the AFI Top 100 movies that come on. It's all very nice, but it's also extremely click-intensive, a feeling intensified by the overall lagginess of the system. Let's talk about that lag for a moment, since it's inescapable: it feels like the entire UI reloads every time you do anything. The primary culprit is the context-sensitive discovery bar, which disappears and reloads entirely from screen-to-screen; it's annoying to the point of uselessness. TiVo says the Premiere doesn't cache images in memory in order to keep RAM usage down, but that doesn't make it any easier to deal with -- besides, RAM's cheap and this entire interface needs to be loaded up and ready to go at all times. Even the first-level menus load in slowly, and they're an entirely local affair -- there's no reason for the same six options under "Find TV, movies, and videos" to take a second to appear every time you select it. It gets worse when you actually try and use the new browse features; not only do the icons and content take measurable amounts of time to load in, the discovery bar reloads itself every time you drill down a level to present more context-sensitive info, so it really feels like the whole UI is blanking out with each click. TiVo says that enabling the second core in the future will speed everything up, since the backend is multithreaded and it'll be able to pull in all this data faster, but right now things are super slow, and it's a major hindrance to using the Premiere. You have to be patient enough to get to what you want, and that undoes the entire premise of tweaking the interface around content discovery -- you can't be spontaneous while you're constantly waiting for graphics to load. Overall, though, the new UI is a dramatic step forward, and once it runs fast enough we'll have no desire to look back. Which is why it's so maddening that the old UI is still just a click away -- TiVo's only redone what it calls the "high traffic areas" of the interface like TiVo Central and My Shows, while the Settings and the Season Pass manager are still the old apps. The system hands off between the Flash-based UI and the older style are fast and mostly seamless, but this isn't nearly the whole-hog makeover you'd expect -- in fact, you can just turn off the new interface entirely and just use the old-style menus. TiVo says it's working to redo the entire interface over time, but for now the Premiere rather uncomfortably straddles two different worlds; the home screen might be futuristic and information-rich, but you still set Season Pass priorities using the same interface that debuted on the very first TiVo in 2001, and it still locks up the entire system while it resolves conflicts. That's unacceptable in 2010 -- let's hope TiVo moves it to the background when it enables the second core. 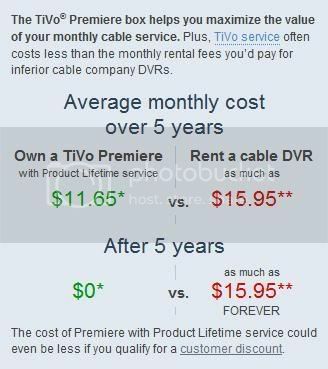 The complete failure of tru2way means that TiVo simply can't support the vast majority of cable on demand services, so you should be ready to give those up if you decide to pick up a Premiere -- unless you're an RCN customer and you have undying faith in the promises of corporate executives. RCN customers will actually be able to get TiVo units directly from the company, and on demand content will simply show up in searches and listings just like Netflix or Amazon -- and the player interface should look similar to those services as well. RCN is scheduled to roll out TiVo support sometime this year, but there's no date -- given TiVo's checkered history with cable companies, we'll believe it when we see it. TiVo DVRs have long featured a secret command that enables 30-second skip, but the Premiere does away with it -- instead, there's a 30-second "scan" that moves forward in about a second by default. It's not as quick as the skip, but it's effective, and we're sure it's keeping advertisers happy, so we'll accept it as a fine compromise between the functionality users want and the demands of content providers. We're also hoping there's another secret command to enable the skip somewhere, of course. We're huge fans of iTiVo and Vuze, which enable you to get shows off your TiVo and put videos back on it, respectively, and they worked with only minor incident. iTiVo was actually just fine, but Vuze got a little confused as to where it was serving files and lost the connection at one point. We continue to wonder: why isn't this functionality enabled or supported by TiVo out of the box? It's been three years since the TiVo HD first arrived and just about a year and a half since TiVo first started beta testing this interface, and after using the Premiere for a day, here's what we want to know: what the hell has TiVo been doing all this time? The new UI is excellent, but it's only skin deep, lags like crazy, and accessing any deeper functionality requires a resolution switch and a fallback to the old interface. The major content partnerships have been in place for a year now, and the interfaces used to access them haven't been updated in any significant way beyond integrating the search results. There's still no support for cable video on demand -- it'll work on RCN eventually, but the rollout doesn't have a firm schedule yet and our experience waiting for Comcast TiVos doesn't exactly fill us with hope. The slider QWERTY remote that should have shipped in the box isn't ready yet and will require a Bluetooth dongle. There's no built-in WiFi. Multiroom viewing support is still extremely minimal, and there's no multiroom recording support at all. Nothing has changed as far as watching your TiVo from a PC, either on your local network or remotely, and there's no support for transcoding recorded shows to a mobile device automatically. Speaking of mobile devices, you know something's gone terribly wrong when both DirecTV and Comcast have robust iPhone apps for remote DVR scheduling and TiVo's got... nothing. We can go on -- hell, we could simply reprint our open letter to TiVo from last April, since the Premiere just barely addresses its main points. TiVo tell us the Premiere as it stands right now is a total reboot of the company's foundation; that more powerful hardware combined with the extensible Flash platform and an interface that merges broadcast content with broadband will enable the company to attract a new breed of consumers in the years to come. That may be so, but it's what the company manages to build on that foundation that matters, and we'd recommend hanging back on buying a Premiere until the software has been revved a few times, or at least until you can buy the QWERTY remote -- that's going to change the experience more dramatically than anything, and if TiVo manages to enable that second core and speed things up while you wait, than so much the better. Let's step back from specific product recommendations and think about the big picture for a second, though. TiVo has almost always defined itself as the shining alternative to garbage cable company DVRs, so much so that its customers willingly give up video on demand to use its more reliable and flexible recording interface. But TiVo's also historically been the only real alternative -- no other company has ever entered the mainstream DVR market with a great product at scale and at a competitive price, and that means TiVo's never had to really compete against anything except its own extremely popular products. That's a recipe for timid incremental change, which is exactly what the Premiere feels like -- TiVo says it's reinventing the DVR, but all it's really done from a consumer perspective is add some nice new (slow) menus to the TiVo HD. The problem is that moving at such a snail's pace has allowed the cable companies to catch up and consumers to move on; if cheap / free cableco DVRs were TiVo's greatest existential threat of the past decade, the combination of cheap / free / good cableco DVRs and the online-only content customer might be the fatal blow of this one. The Premiere is the DVR we wanted two years ago -- TiVo's challenge will be to make it the DVR we want two years from now. It better not use only blue tooth for remote control. I don't want to give up my harmony 890. As far as migrating from your old box to the new one, I would just add it and keep the old one as well. More tuners is always a good idea. I think the bluetooth is only for the QWERTY remote, which apparently isn't even coming out til fall anyways (and will set you back up to $100). This Engadget review just re-affirms what a disappointment this is. Doesn't mean I won't get one since I'll need another DVR and am eligible for the lifetime discount and cashback, but I was expecting waaay more. So they removed a CC slot and put it in the back. That stinks. Given the propensity of problems with cable cards, they should've left the slot in the front. And given that many cable companies (our own TW Albany included) claim they only have S cards, you almost need two cable cards (and in some parts of the country TW offices still force some customers to purchase/rent two S-cards). Oh well, saved me about $500 I guess. When they have a TiVo that incorporates whatever technology it is that can allow me to use TWC's PPV services, not have a Tuning Adapter, and allow streaming to other TiVos, I'll upgrade. Should we take bets if that happens first or if Verizon ever has FIOS here? I'd bet on the Lotto. TiVo would have to do some serious work to handle streaming, everything is based on a persistent copy stored on the TiVo displaying the video. It can be done, that's how the NetFlix player works, but it would a fair chunk of work.